Canceling your subscription is a straightforward process, but there are some things to be aware of before you take the plunge. If I cancel my annual subscription early, do I get a refund? If I cancel my subscription, will I lose any progress I've made? How to cancel your subscription. I'm trying to cancel my subscription, but I'm not seeing the right buttons. Like pauses, cancellations can be initiated at any point in your billing cycle — however, they do not go into effect until the end of your current billing period. You'll maintain access to the missions available under your subscription up until that point. 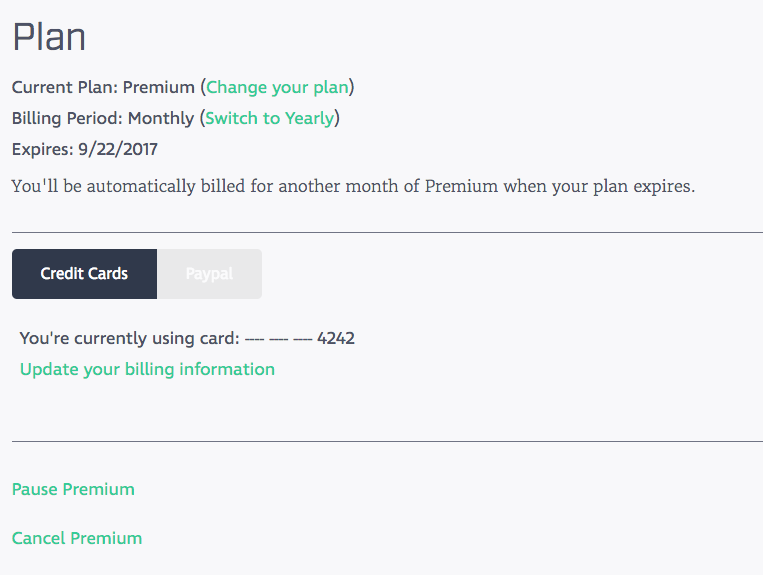 Annual subscriptions cannot be canceled early — because cancellations take place after the current billing period ends, it wouldn't go into effect until the year after you originally subscribed to the plan. We give significant discounts on our annual plans in exchange for your flexibility, since you're pre-paying for the entire year — once payment has been made, you are committed to working through the course for the year. All progress is saved, regardless of your subscription status. Furthermore, you'll still be able to download any code you've written directly from your Profile page. Keep in mind, though, that once your subscription ends, you will only be able to access missions that are available under the Free plan. In the case you're trying to cancel your account but you're not seeing the pause and cancel options above, you may be running into the Team Account bug, which occurs when you've created a team — it prevents access to your personal account management page and, instead, only gives you the option to manage your team.